Miami Beach has some of the most gorgeous waterfront homes in the world. Star Island Miami Beach is a prestigious private island within the City of Miami Beach, which fulfills that thought. Star Island is a guard-gated man-made island that offers 24/7 security and privacy to residents. Situated within Biscayne Bay, Star Island is only accessible via the MacArthur Causeway. Star Island offers very few lots, making property on this island highly coveted. 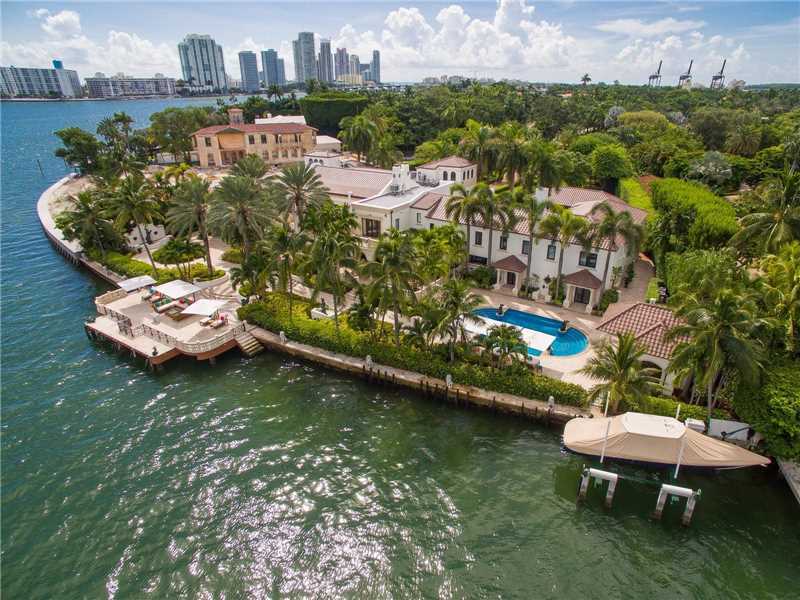 Take a look at the top 3 Miami Beach waterfront homes for sale on Star Island; we’re sure you will find them to your liking. This historic masterpiece located at 46 Star Island Drive, Miami Beach, FL 33139 was built by Miami Beach pioneer Carl Fisher of Fisher Island fame. This 20,000 square foot Miami Beach waterfront home has over 40 rooms throughout, with 10 bedrooms and 10 baths. This sprawling estate was completely renovated with meticulous attention to its original integrity. Soaring ceilings, a ballroom size living room, and a 3,000 bottle wine cellar are some of the luxurious features of this home. The home has 3 offices and staff quarters. Situated on the tip of Star Island, this home is one of the most sought after addresses in Miami Beach. Listed at $65,000,000 this home is perfect for anyone who loves to entertain and for avid boater as the waterfront home sits on a 61,000 + square foot of land and offers 255 feet of panoramic waterfrontage. This magnificent estate located at 1 Star Island Drive, Miami Beach, FL 33139 rests upon an impressive 58,332 square foot corner lot with nearly 240 feet of waterfrontage. This home offers sparkling unobstructed views of Biscayne Bay and Downtown Miami. The estate boasts a beautiful 2-story, 4 bedroom, and 5 bath Floridian villa with open verandas facing the bay. The estate also has a separate and private 3 bedroom, 3 bath guest house. The main house showcases a spacious gourmet kitchen with white cabinetry, top-of-the-line appliances, and a large center island. The estate sits on lushly landscaped grounds with tropical foliage and palms, as well as a resort-style pool and spa with a private dock. Listed at $37,000,000 this home is perfect for someone who has frequent out-of-town-visitors, or would like to use the guest house as in-laws quarters or a separate home for their adult children. This fantastic Miami Beach waterfront home located at 45 Star Island Drive, Miami Beach, FL 33139 is a boater’s dream with over 190 feet of waterfrontage. This home sits on a 46,429 square foot lot and offers buyers southeastern breezes, and stunning sunrises and sunsets. This residence is over 10,500 square feet in size, with 7 bedrooms, 7 full baths, and 3 half baths. The detached guest house has 3 bedrooms and 2 baths. This dream location truly represents the pinnacle of the Miami Beach lifestyle. This home is perfect to renovate or to demolish and start from scratch. Listed at $16,500,000 this home is perfect for someone who loves to live a private, secure, life, despite being in the heart of South Beach. If you are interested in any of these fine Star Island Miami Beach waterfront homes, contact us at pobiakproperties.com, and we will be glad to give you a tour of these homes, as nothing compares to docking your yacht at your Miami Beach tropical oasis. If you are interested in seeing additional Miami Beach waterfront homes or Miami Beach waterfront condos that are currently on the market, we would be glad to show you those as well. At Pobiak Properties, we care that you find the home that is ideal for you and your Miami Beach lifestyle. This entry was posted in Miami Beach Lifestyle, Miami Beach Luxury Real Estate, Miami Beach Waterfront Homes, Star Island and tagged David Pobiak, Miami Beach, Miami Beach Real Estat, Pobiak Properties, Star Island, Star Island Miami Beach on March 15, 2017 by Giancarlo Bobbio.